Are you interested in getting up to 20% more generation from your Solar PV System? Did you know that… when your PV system is generating at full capacity your inverter could in all likelihood be in over-voltage mode and not generating at all ? By monitoring the incoming supply voltage, the BOS Solar + PLUS allows the Solar PV inverter to compliantly stay in circuit for longer, preventing nuisance over voltage shut down. 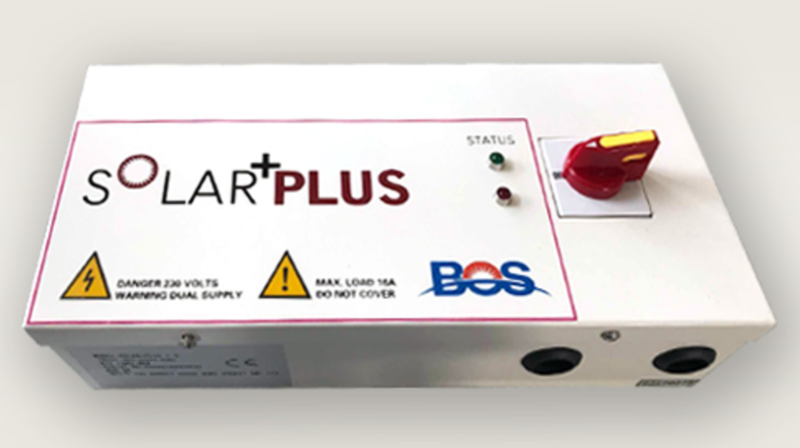 The Solar + PLUS can reduce stress through voltage overheating and increase PV generation. Have a look at our Solar Plus Plus video to learn more! Solar PV system inverters have to increase their supplied voltage, by typically 4 volts, to be able to push the generated energy against supplied national grid energy around your property and if not used back onto the national grid. Typically if the energy supplied to a solar PV inverter rises to 253V, the inverter cannot push the generated energy over this and so enters ‘over voltage mode’. PV generation is typically halted for 5 minutes (depending on inverter settings) after which time the inverter checks to see whether the incoming voltage is now below 253V so it can begin generation again. If it is still above 253V it will re-enter ‘over voltage mode’. NOTE: No electricity from your solar PV is generated whilst your inverter is in ‘over voltage mode’. So the Solar+Plus when installed, monitors the incoming supply voltage to the PV inverter. 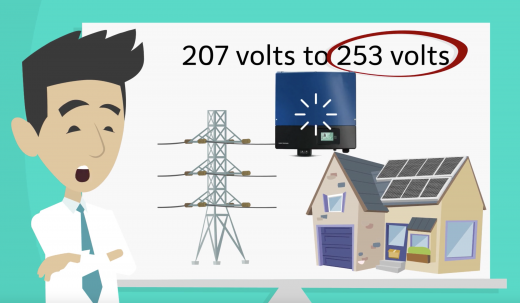 The National Grid voltage is not constant and suffers from surges, when the National Grid voltage exceeds 253V the Solar+Plus disconnects the PV inverter from the national Grid, allowing the Solar PV inverter to avoid going into over voltage mode. This allows the inverter to be able to continue to operate and generate electricity from the PV array for longer. As well as keeping your PV inverter out of over voltage mode, when the incoming voltage is below 253V, the So-lar+Plus is still working, utilising a transformer to step down the incoming voltage. This lessens the output requirement of your inverter, which has to increase their supplied voltage to be able to push generated energy against supplied energy, reducing the workload on your inverter. The Solar+Plus works with all brands of solar PV systems. Simple to fit and can be installed in less than half a day. Once installed the Solar+Plus is maintenance free. The Solar+Plus has been designed to fit in with the existing consumer unit, offering a clean, aesthetically pleasing appearance. The Solar+Plus can only be opened with the power switch in the off position. The Solar+Plus is built with a non combustible metal case. The Solar+Plus can negate the need for a second rotary AC isolator, needed in standard PV installations. WHEN THE GREEN LIGHT IS ON, YOU ARE SAVING MONEY! All Solar+Plus come with a 5 year manufacturer’s parts guarantee.